A dermatoscope is an instrument for examining the skin. It includes a system of magnification and a light source to improve the practitioner's view of the area in question. 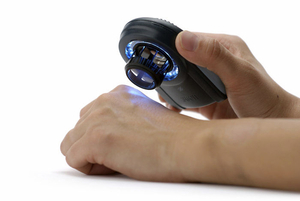 These devices are used in the diagnosis of cutaneous lesions, especially melanomas and other tumors. Traditional models make use of optical magnification. Digital versions may include video and USB capability. Some are equipped with LED, multi-spectral or polarized illumination. Choice will depend primarily on portability and precision, including image quality and magnification. There are even pocket models.